The Maxi Comfort is suitable for adults who have balancing problems, difficulty in getting on and off a bike and need to ride in an ergonomic cycling position. This has a low spacious step through and easier sitting position. Instead of above the pedals, you sit a little behind them. This gives you a lower sitting position, so you can always mount with both your legs on the ground and have optimum space for knee movement. In this variant you do not need to raise the legs high for mounting and can draw the seat underneath yourself and then sit. 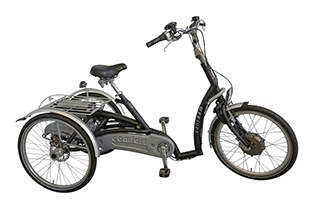 With a lower centre of gravity this tricycle feels more comfortable than the conventional ones. The lower sitting position places lesser burden on your back, shoulders, neck and wrists. The Maxi Comfort is available with a smaller, standard and extra high frame. Many people find this cycle easier to ride than a traditional tricycle. There are many options available, such as gear lever, backrest, footrests and an electric engine for power assist.